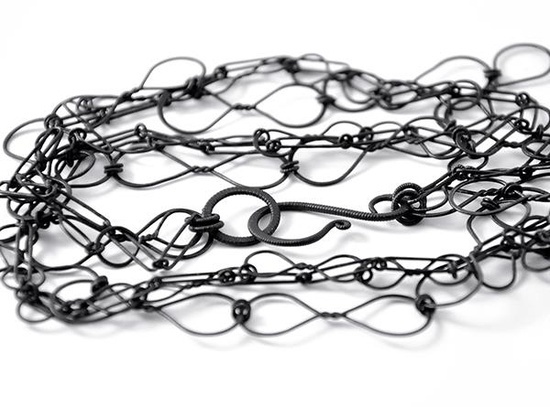 With a background in textiles, Erica Schlueter uses fiber processes in her jewelry creations. She elevates the humble act of knitting and highlights the beauty of repetition. 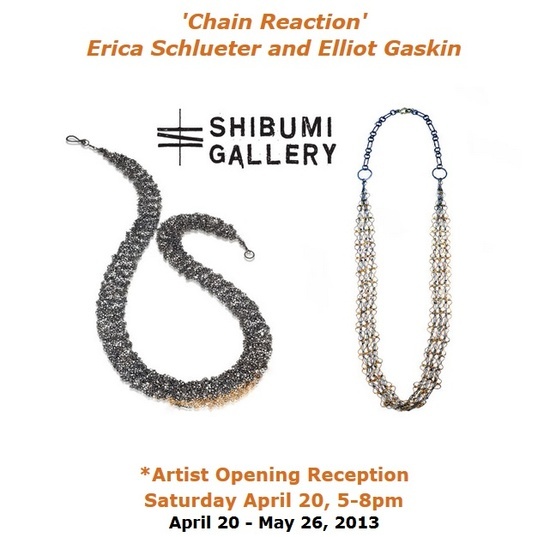 Shibumi Gallery is hosting an exhibition that puts the spotlight on chain making. Titled ‘Chain Reaction,’ the exhibition will showcase works by contemporary art jewelers Elliot Gaskin and Erica Schlueter. It will feature jewellery made using traditional chain making and knitting techniques. In Gaskin’s work, darkened steel is combined with yellow brass to forge large, ornate chains. The necklaces fabricated for this show were inspired by the gates of the Chateau de Versailles. Schlueter’s work, meanwhile, were crafted using fibre and textile techniques to knit delicate silver and gold chains. The exhibition opens on April 20 and will run until May 26 at Shibumi Gallery in Berkeley, California. « I’m really excited for this new collection inspired by the gates of Chateau de Versailles. The work that lead to my further exploration of steel and this new collection will premiere at Velvet da Vinci this Friday at the opening of FERROUS. The exhibition will feature jewelry made of ferrous metals by local and international jewelers.